We cater to a number of diplomats and visiting dignitaries, employees and residents of various Embassies, visa applicants, immigrants and their families, along with the local community. We also routinely organize free medical camps and charity events to give back to the community. General health check-up packages are our forte as well – as we provide compact, yet comprehensive packages all under one roof for patients / employees / companies who would require routine health check-ups. We emphasize on the importance of time – and we make sure our patients breeze in and out without any delay beyond the time frame mentioned while booking an appointment. We also provide consultations and advise for tourists and travelers traveling, working or studying within the Indian sub-continent, as well as for traveling to the neighboring countries of Sri Lanka, Nepal, Bangladesh, Maldives among others, along with a wide range of vaccinations and routine immunizations. We also provide assistance and recommendations for travelers to both the Indian Subcontinent as well as the neighboring coutries in regards to local hospitalization & medical help. Helvetia is empanelled with various embassies for these medical checkups for foreign visas. 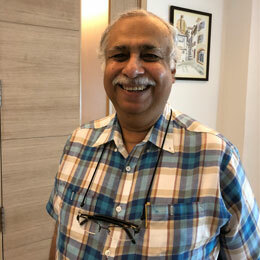 Dr. Bhalla has well gained reputation as a senior consultant physician. Dr. Bhalla has been the Honorary Physician to the 10th. President of India. At present he is also the consulting physician to the Embassies of Belgium, Greece and Turkey. Armed with three decades of rich experience in the medical field, he has di-ligently established a medical practice in New Delhi and is currently retained as Medical Advisor by The Oberoi, New Delhi, Hotel Le Meridien & Lodhi Hotel. At the Embassies of Greece & Belgium, he has been carrying out the medical examination for all prospective immigrants and students to Greece & Bel-gium, and also conducting the DNA testing for immigrants to Belgium as per the International Health Regulations of the World Health Organization.